IMPORTANT! - You must live within a 50 mile radius of a Home Depot hardware store in order to receive delivery of the frame poles. If you do not live within that range, the frame poles WILL NOT be delivered to you and you will have to make arrangements to drive to the closest Home Depot and pick them up, yourself. Our Cimarron 55 ft L x 12 ft W x 12 ft H residential batting cage frame is an easy and economical way to hang a batting cage net in any open space. Kit comes with everything you need to assemble and hang your net. Please Note: This kit does not include a net nor does it include frame stakes. Batting cage nets can be purchased separately. Once assembled, this frame will not stay upright during high winds. 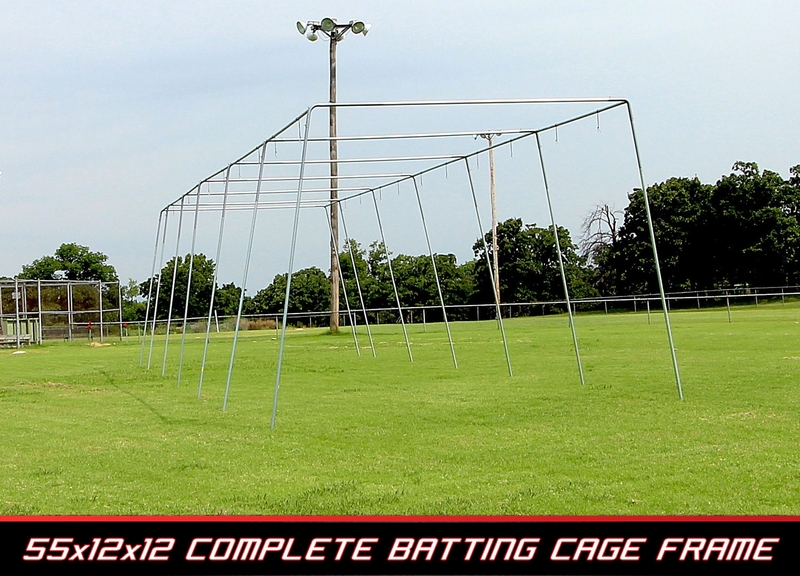 It is an extremely good idea to further stabilize your batting cage frame during light and moderate winds with stakes. We do not sell them but there are various stake options at places like Home Depot, such as these. Q: I am interested in your frame, I was wondering how would I fasten it to concrete. I would like to put it on my rv parking on side of house, not grass.? A: This particular batting cage is not meant to be cemented into the ground. It has legs that splay out and people normally use tie-downs and stake it into grass for added stability. That said. I supposed it would be possible to do the same thing with buckets of sand. The best solution would be to get the correct batting cage for what you want, which is the Cimarron 55'L x 15.5' W x 12' H Complete Permanent Commercial Batting Cage. It has ground sleeves which are cemented into the ground and it sits on straight poles that slide into those sleeves. You might also consider the less expensive KIT version of that cage - Cimarron 55'L x 15.5' W x 12' H Permanent Commercial Batting Cage Kit. You just have to pick up the metal conduit poles at Home Depot, but even after purchasing those, you would save more than $300 versus purchasing the complete frame, poles and net kit. Finally, if you have your own net and just need the frame, you would want either the Cimarron 55x15.5x12 Complete Commercial Batting Cage Frame which includes the poles, or the KIT version, where you purchase the poles yourself and save money - Cimarron 55x15.5x12 Commercial Frame Corner Kit. THE CIMARRON GUARANTEE: Cimarron Sports guarantees 100% satisfaction with your 55' x 12' 12' Batting Cage Frame. Products may be returned for a refund within 31 days of the date the product was shipped to you, when returned in accordance with the Cimarron Sports policies outlined in the Shipping & Returns section of this website. Click here to download an easy to read, printable PDF of the Cimarron 55x12x12 Complete Residential Batting Cage Frame Owner's Manual.